Group 31 compact rotary actuators, models 31-M50 and 31-M30, include a single analog electronic control module which receives a 4–20 mA or 1–5 V dc input signal and provides a 4–20 mA or 1–5 V dc feedback for position control and indication. Electronic module has a deadband of 1.0% of span with sensitivity of 25% of deadband. The input signal span is nominally adjustable from 50% to 125% of the 4 V span, with the zero adjustable up to 120% of span, providing flexibility for split range operation. The uniquely low power draw of Beck Group 31 drives permits the use of various standard uninterruptible power supplies for operationduring loss of AC power. Beck Sales Engineers can provide you with specifications on UPS equipment recommended for Beck drives. 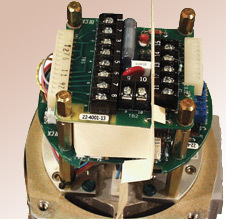 Beck Group 31 drives equipped with feedback capability use a film potentiometer incorporated into the control module. All modulating models feature electronic position indication. Direct AC models allow controllers to monitor drive position as the controller output directly positions the drive. Analog control modulating models provide electronic signal receiver circuitry, which compares the position indication to the control loop demand signal and provides automatic control. Models 31-M50, 31-M30, 31-350, and 31-330 have dual feedback capability, permitting user choice of 2-wire or 4-wire field connection. Connections for feedback selection are made in the field and need not be specified on order.